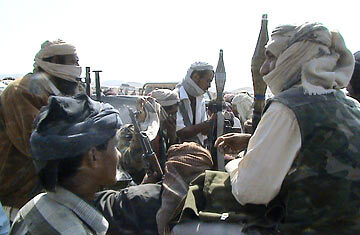 Southern Yemenis pile their weaponry onto a truck in the village of al-Maajala. Yemen's Hidden War: Is Iran Causing Trouble? With Yemen apparently on the verge of becoming the world's next failed state and a regional base for al-Qaeda, a series of U.S.-assisted air and ground assaults that shook pockets of Yemen last week might have seemed like a positive development in the troubled country's otherwise downward spiral. But the dramatic action, which appears to have resulted in a number of civilian casualties, may not right the situation at all. "The U.S. has been growing very concerned about al-Qaeda in recent years, but it seems as though the U.S. is coming rather late to the party," says Princeton University Yemen expert Gregory Johnsen, who contends last week's attacks would ultimately prove counterproductive. Immediately after 9/11, a combined U.S.-Yemeni effort to decapitate the Islamist group's leadership in the country and dismantle its infrastructure met with considerable success, Johnsen says. But since 2006, al-Qaeda has managed to regroup and grow stronger as Yemen's government struggles to hold on to its territory amid multiple rebellions and rising poverty. Now, Johnsen adds: "You can't just kill a few individuals and the al-Qaeda problem will go away." At least 34 people died last week, when Yemeni forces hit suspected al-Qaeda targets in the southern governorate of Abyan and in Ahrab, a district northeast of the Yemeni capital Sana'a. Western and Yemeni media outlets reported that the United States provided Yemen with key intelligence and firepower to carry out the strikes, but to what extent is unclear. Yemeni state media reported that President Obama phoned Yemeni President Ali Abdullah Saleh to congratulate him on a job well done, and ABC News said that U.S. cruise missiles had been used. But regardless of who did what, a primary target in the attacks  Qasim al-Raymi, the al-Qaeda leader who is believed to be behind a 2007 bombing in central Yemen that killed seven Spanish tourists and two Yemenis  is still at large. And reports of a U.S. role, and mass civilian casualties at the sites of the attacks, have sparked a public outcry and added to anti-American sentiments across the country. "They missed that individual," says Johnsen of the targeted al-Qaeda chief. "And at the same time, they ended up killing a number of women and children in the strike on Abyan. So now you have something where there are all these pictures of dead infants and mangled children that are underlined with the caption 'Made in the USA' on all the jihadi forums. Something like this does much more to extend al-Qaeda." Indeed through the backlash that followed, the attacks have started to look like more of a boon than a bust for Yemen's al-Qaeda revival, as well as for other opponents of Yemeni President Ali Abdullah Saleh's regime. Iran  which Yemen accuses of backing the Shi'ite Houthi rebellion in the north  headlined the attacks on its state-sponsored Press TV with: "Obama ordered deadly blitz on Yemen." "The al-Qaeda threat in Yemen is real, but now after this operation, it will be greater," says Mohammed Quhtan, a member of Yemen's opposition Islamist al-Islah party. "Al-Qaeda will be able to recruit a lot more young people, at least from the tribes that were hit. And it will have reasonable grounds to attract more people from Abyan governorate, and from the Yemeni population in general." That's a frightening prospect for a country on the brink of collapse. Yemen's economy is in tatters; its population complains of neglect and development woes; and Yemeni children suffer from a 50% malnutrition rate. Observers warn that poverty and unemployment are prime recruitment factors for al-Qaeda, something they say the U.S. government and other foreign powers should have done more to address. "If you're going to carry out [an attack] like this, you have to have done a great deal of field work, where you've sort of undermined al-Qaeda through development and aid so that when something like this happens, al-Qaeda can't easily replace the individuals that it has lost," says Johnsen. "But if you don't take those steps then the pool of recruits just starts to multiply exponentially." More troubling still is that last week's assault doesn't necessarily indicate a renewed Yemeni commitment to fighting al-Qaeda. Analysts say Yemen has been slow to confront the al-Qaeda threat with the gusto that the U.S. has been pushing for, in large part because going after the Islamist group hasn't always been in the government's best interests. "If the government wants to fight [al-Qaeda] seriously, they can do it," says Ali Saif Hassan, the director of Yemen's Political Development Forum. But, he adds: "It's a matter of political decision  how much they will win, and how much they will lose." Sana'a has recently focused more of its attention on the rebel separatist movement in the south and on the recent Houthi uprising in the north than it has on al-Qaeda. While some western analysts say that al-Qaeda seeks to overthrow Yemen's government, Hassan disagrees, saying that al-Qaeda only seeks to establish a base there  a link between the Horn of Africa and the rest of the Arabian Peninsula  and that so long as Saleh leaves al-Qaeda alone, they'll do the same for him. "The government still sometimes thinks it is too costly for it to fight al-Qaeda. If you ask them to go and fight al-Qaeda, they say 'Why? And what do I get back?'" says Hassan. Fighting al-Qaeda would mean losing key fundamentalist support in the country, support that is already falling away. What would compel Saleh to turn it around? "It is business," says Hassan. "If the government gets more support from the Americans, they will change." The Obama administration has requested $65 million to help Yemen battle its resurgent terrorist threat. Last week's attacks may mean that change is indeed on the horizon. But if the Yemeni backlash to the attacks are any indication, cruise missiles and firepower may not be the support Yemen needs. See the top 10 pictures of the year.